Options for telehealth equipment are endless. There are portable videoconferencing carts, integrated room systems and desktop systems for PCs and laptops. Web-based and mobile device options for videoconferencing are becoming more available and, in some cases, compatible with traditional systems. Remote monitoring options are being incorporated into mobile and wearable devices. With the explosion of technologies on the market, equipment selection can be both exciting and daunting. UTN is available to assist with equipment or infrastructure selection, including room design and technical recommendations. UTN has an expert technical and clinical team to provide customized consultative services to assist in the selection process. Electrical safety – Site’s facility & engineering department can determine requirements, including possible use of isolation transformers, especially in emergency departments and inpatient rooms. Medical Peripherals for clinical applications - There are many peripheral instruments which can be attached to the clinical practitioner's cart that can assist in an interactive examination, such as: Digital stethoscope, Otoscope, Ophthalmoscope, Total exam camera, and etc. There are numerous mobile devices and remote patient monitors available. The FDA has issued final guidance on mobile devices and medical devices. 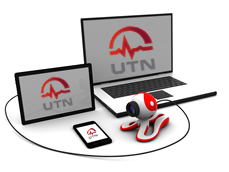 UTN highly recommends that vendor maintenance be kept current on telehealth equipment, especially codecs, cameras and monitors. It is essential to ensure equipment replacement, if needed, and to install software upgrades.